RoRo kithen and dining products are individually hand-crafted by artisans from sustainable, plantation or orchard wood. 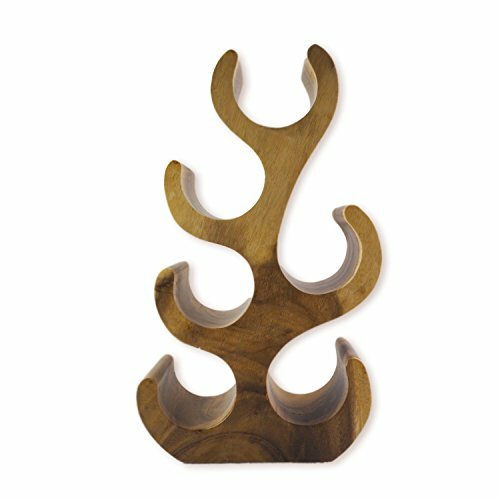 For this wonderful piece, Artisans hand-carve the wood to create a wonderful "antler" look. The result is a simple yet stunning rustic art piece that we hope you enjoy as much as we do. Suitable for any lodge, cabin, mancave, wine cellar or boutique diner. The piece comfortably holds 6 wine bottles. Please clean with a damp cloth. 17"H x 9"W x 4"D. Can hold 6 bottles. If you have any questions about this product by roro, contact us by completing and submitting the form below. If you are looking for a specif part number, please include it with your message.